Long suffering companion: What wine should we get? Me: Well, I feel it has to be California. Me: Zinfandel. Has to be Zinfandel. I’ve just read about massive a Zinfandel fraud. Long suffering companion: Whatever you want. 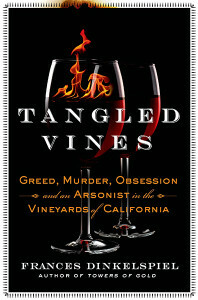 Naturally, I chose to review Tangled Vines because of the obvious parallels between wine crime and art crime. In both cases we have a collectible, expensive, elite good which is closely associated with money and class being faked, stolen, and destroyed. Many of the same mechanisms as art crime are at play when we evaluate wine crime. Indeed, this may as well be cookie-cutter white collar crime: it is the same type of fraud. Even more interesting, because of the small world of money, wine crimes and art crimes share many key players. Art collectors are wine collectors. Art auction houses also auction wine. Dealers and buyers who don’t ask questions, whose transactions are based on ‘trust’ and ‘reputation’ rather than on sound provenance checking. Indeed the author, Frances Dinkelspiel, uses that art world term ‘provenance’ time and time again to refer to the ownership history of a valuable bottle of wine. Provenance, as usual, is key and provenance, as usual, is overlooked. And you know what? The author of Tangled Vines was one step ahead of me. She sees the relationship between wine crime and art crime as meaningful and mentions it in the text. As I sat there, sipping my California Zinfandel (real? fake? ), highlighting passages of the book where wine criminals remind me of art criminals (and wine collectors of art collectors), Dinkelspiel flat out said it. I raised a (possibly fraudulent) glass to her. Then I took to the Twitter to suggest someone out there do a “crimes of the powerful/white collar crime” focused PhD in criminology on wine. Maybe I should write a paper. I’ll file it next to my ‘rare orchid smuggling’ obsession. 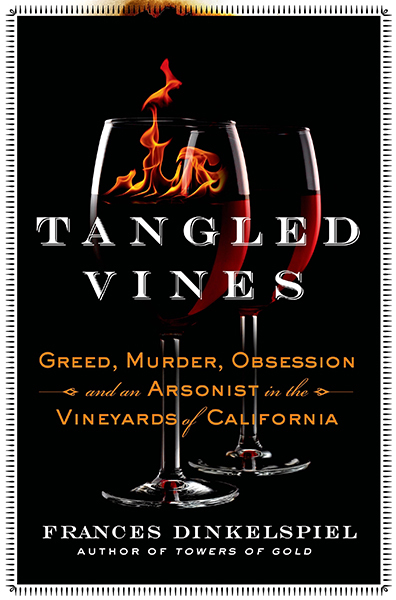 In Tangled Vines, Dinkelspiel weaves a tangled tale, oscillating between the history of California wine production, the crimes and convictions of a modern wine criminal, and her own family’s past. “Tangled” implies confused and this book surely isn’t confused. Interwoven. Wonderfully interwoven. I went from knowing nothing about the history of California wines to knowing just enough to both make me want to learn more (cue late night Wikipedia meander) and to make me truly appreciate the joy that wine collectors feel from engaging in their passion and the loss that wine fraud and destruction brings to both the industry and the connoisseurs. 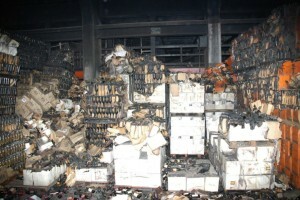 One shot of the result of the wine warehouse fire. 4.5 million bottles of rare wine were destroyed. Photo by ATF. The main thrust of the story is on the crimes of Mark Anderson, a wine lover and for-profit-storer who has been convicted of theft and arson for stealing his customers’ wine and then starting a massive fire in the wine storage facility he was renting space in, presumably to cover his tracks. Among the wines destroyed in this fire were 175 bottles of extremely old port produced by the Dinkelspiels’ great great grandfather, Isaias Hellman, in the 1870s. Thus the author’s interest in this crime is driven not solely by the inherently titillating nature of hundreds of millions of dollars worth of wine being destroyed in one go, but by the personal. Her own history was destroyed in the blaze along with California’s history. As the tangled vine unfurls, the story becomes one of misfortune and disaster. Murders, floods, earthquakes, prohibition: everything seems to be working against California’s wine industry long before we get to the modern wave of wine forgers, thieves, and arsonists. Yet wine is still bottled despite these seemingly-insurmountable setbacks. I can still drink my (now suspect) California wine on a sofa in Scotland and think about the hard work involved in getting the bottle to me. I have no tongue for wine, but I have one for complexity and wine history is complex. And filled with crime. Lots and lots of crime. Who just bought a stack of other wine crime books? Me. I did. That’s a pretty good recommendation for Tangled Vines. I was sorry the book was over and I want more. Potential wine crime PhD students or co-authors, do get in touch.